There’s something irresistibly loveable about a quirky horse. Sure, they might not get along with everyone...OK, most people...and sure, sometimes that sassy side eye or extra attitude when you don’t cue “just so” can get on your nerves from time to time, but you just can’t help but love them all the more for it in the end. The quirky ones are the interesting horses. The ones that push you to work a little harder until you’ve figured them out. They’re the ones that make you laugh a little more when their expressive personalities make their opinions oh-so apparent. And they’re the ones that make your heart and pride swell even more when they pick you as their person to love. Chance agrees, and he made sure we knew it during his portrait session! He especially enjoyed poses in which he was being “admired” … and quickly grew disinterested whenever Amanda was the intended star of the shot. Needless to say, he kept the evening interesting! Amanda, I had a wonderful time meeting you and Chance. I know why the On the Mark girls love you so much—you’re just so much fun to be around! Even on a hot, sticky night, you looked absolutely gorgeous laughing and smiling at your silly boy—your love for him just shines out of you! I can’t wait to send you the rest of your gallery...hilarious outtakes and all! 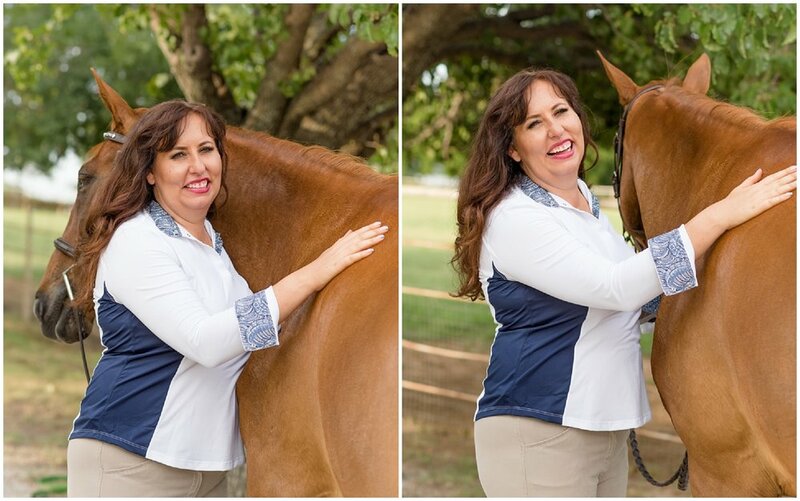 Dreaming of your own horse & rider portrait session? Contact me to start planning today! Hang out with me on Facebook & Instagram for updates, session sneak peeks & more!